Bhopal: State Museum of Archaeology Department has become a centre of attraction. Student teams and officials from other states are making regular visits here to review the archaeological remains, materials of archeological importance and ancient rare statues displayed in galleries of the museum. The students team and officials from Delhi reviewed archaeological and historic material at the museum on Thursday. The 34-students team from Assam Bailey School, Shobhitpur led by Dr. Nidhi Singh gathered information about the archaeological remains in the excavated galleries of the museum. The team apprised themselves with trade in ancient India and process of give and take of ethics. 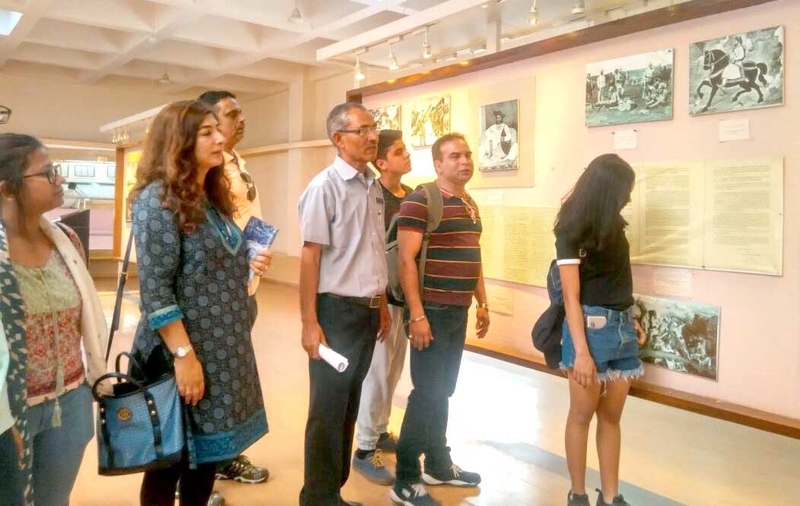 A 24-member team from Ahmedabad’s United World Institute of Designing Institute also reviewed and drew skectches of the art remains exhibited at the museum. The team was led by Professor Vijay Puniya. Dr. Anil Ghei from Dew Delhi apprised himself with the history of Gwalior state, state’s records, mudras, miniatures, statuettes etc. displayed at the museum. In the meantime, Raj Singh from Department of Tourism, Delhi also visited the museum. Members of the students’ team Smt. Swapnil Gupta, Priyanka Thakkar, Shreya and Suvarna Saxena drew spot sketches of the designs of the statues at the museum.